This page is designed for kids of all ages and features pictures from God's creation and discussions about the Bible that kids can understand. Mr. Rob take pictures of wild animals in different places around the world. Mr. Rob has a good friend named Gui Gui (pronounced "gway-gway"). Gui Gui is a Chinese name that means noble and honored. Rob is honored to have Gui Gui as his friend. Gui Gui was born in China and he is 9 years old. Mr. Rob and Gui Gui both live in South Carolina and they are both very interested in nature and wildlife. They also share an interest in the Bible and they want to make it easier for kids to understand what the Bible is all about. By the way, if you like this web page, please tell your friends about it. ​The picture above of a bull elephant was taken by Mr. 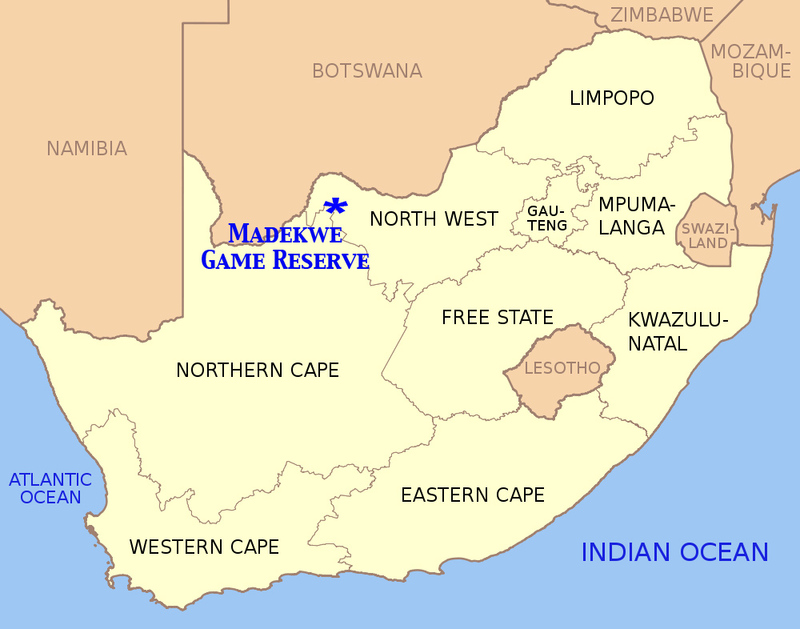 Rob in the Madekwe (pronounced: "mad-dee-quee") Game Reserve in northern South Africa. A game reserve is a place where animals are managed and protected from poachers (poachers are people who hunt animals illegally). ​You can see where the Madekwe Reserve is located on the map below. The lighter colored section of the map is the country of South Africa. Mr. Rob & Gui Gui talk bbout the African Bull Elephant in the picture above. Mr. Rob: "I took this picture when I was in South Africa. 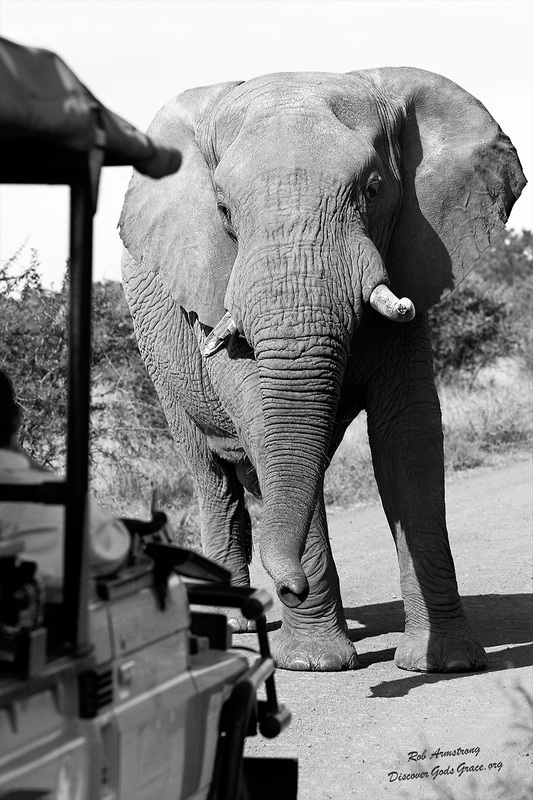 I was in an open-top safari jeep with a jungle guide in the Madekwe Game Reserve. We were watching a group of elephants walk past, when suddenly this big bull elephant turned and blocked our path. When this happened, my guide shut off the vehicle's engine and told us to be very quiet and to hold very still. The reason he did this is because elephants can sometimes be dangerous especially if they feel threatened." Gui Gui: "Elephants are so strong that they can even pull trees up out of the ground." Mr. Rob: "That's right and African elephants are the largest land mammals in the world, weighing up to 16,000 pounds! That's four times heavier than most cars, vans and SUVs! That means that they could easily crush a car, just by sitting on it! Elephants show their power, strength and dominance (they show who's the boss) by charging and/or swaying back and forth.The elephant in the picture was very close to us and he was swaying back and forth and making it clear that he was the boss! 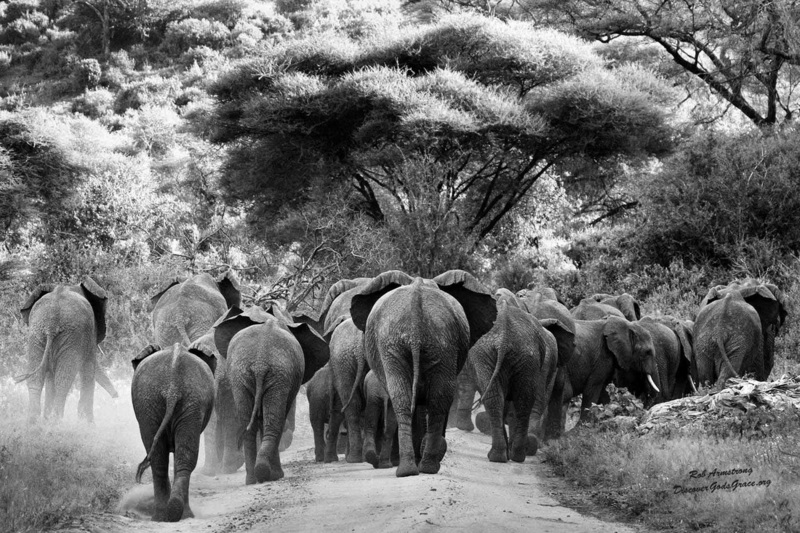 So I was glad when, after a few minutes, he turned and followed the other elephants down the dirt path." Gui Gui: "Did you know that Elephants have unique toe pads on the bottom of their feet so that they can move very carefully and quietly." Mr. Rob: "Wow. I didn't know that. Its really amazing that God designed such enormous and heavy animals in such a way that that they can walk softly." ​Gui Gui: "I've heard that elephants have been known to sneak into areas where people are growing banana trees and secretly steal the bananas without anyone seeing or hearing them." ​Mr. Rob: "That's funny! Did you know that in the Bible it says, 'The Lord God formed from the ground all the wild animals and all the birds of the sky. He brought them to the man [who was named Adam] to see what he would call them, and the man chose a name for each one. He gave names to all the livestock, all the birds of the sky, and all the wild animals.' (Genesis 2:19-20 - New Living Translation). That must have been so neat to have the opportunity to give each animal its official name! What if God told you that it was your job to give all the animals their names, would you call an elephant an "elephant" or would you give it another name?" Gui Gui: "I think I would probably call it a 'Hugo'!" Mr. Rob: "I think I would have named an elephant a 'super-sized trunk monster'! Elephants have two tusks. Tusks are like giant teeth that protrude (stick out) right next to the elephants mouth. Can you think of any other animals that have tusks?" Gui Gui: "I know that a Walrus has tusks." Mr. Rob: "The bull elephant in the picture has a tusk that is partially broken. How do you think that happened?" Gui Gui: "Elephants sometimes charge and fight other animals like rhinos. It may have been damaged that way." Mr. Rob: "And elephants also get into battles with other elephants and sometimes their tusks get damaged when they crash into each other. Their tusks can weigh over 200 pounds each! That's more than a lot of grown men weigh! I sure wouldn't want to have an elephant crash into me! The Bible makes it clear that elephants, and all the other animals in the world, were designed and created by God. The Bible says, 'God made all sorts of wild animals, livestock, and small animals, each able to produce offspring [baby animals] of the same kind. And God saw that it was good'. (Genesis 1:25 - New Living Translation). The New Testament section of the Bible also tells us that it was Jesus who created all things. '[Jesus], who is called the Word, is Himself God, and He created all things. Nothing in the universe has ever been made without Him.' (John 1:3 - paraphrase). 'For by Him [Jesus] all things were created that are in heaven and on the earth...All things were created by Him and for Him.' (Colossians 1:18 - paraphrase). Not only did Jesus make all the animals, but he also created you and me. We were actually created for Him. What happened after God created Adam and Eve? Did they obey Him or disobey Him?" Gui Gui: "They disobeyed Him." Mr. Rob: "How did they disobey God?" Gui Gui: "By taking a bite out of the fruit that God told them not to eat." Rob: "That's right and, as a result of Adam and Eve's disobedience, they made themselves God's enemies. Not only that, but everyone of us has followed their example and continued their pattern of disobeying God. We demonstrate our disobedience to God when we think or do wrong things (like when we tell a lie, take something that belongs to someone else, or disobey a parent. But the good news is that God solved the problem of our disobedience and sinfulness by coming up with a way for us to be completely forgiven and made right (righteous) in His sight. Do you know what God did for us?" Gui Gui: "He sent his Son to die on the cross." Mr. Rob: "Yes. The Bible says that God the Father loved us so much that He sent His Son Jesus to the earth to die for all of our sins. 'For God so loved the world that He gave His only Begotten Son, that whosoever believes in Him will not perish (will not be separated from God forever), but will have everlasting life (they will live forever in heaven with God).' (John 3:16 - paraphrase). The Bible teaches us that anyone, no matter how bad they have been, can be completely forgiven if they will only believe that Jesus died and rose again for them. 'All the prophets of the Old Testament wrote about Him in advance and told us that everyone who believes in Him receives forgiveness for their sins through the name of Jesus'. (Acts 10:43 - paraphrase). This is all the result of God's goodness, kindness and generosity (God's grace). Jesus did this for you and me, and everyone else who is reading this article. He did this because He wanted to rescue us from our sins and make us His friends and loved ones. 'To all who did receive Him, to those who believed in His name, He gave the right to become children of God—' (John 1:12 - New International Version). 'For you are all children of God through faith in Christ Jesus.' Galatians 3:26 (NLT). ​Boys and girls, if you are reading this article, you can be completely forgiven of all your sins and become part of God's family simply by believing that Jesus died for you. To believe someone means that you trust that person. When you believe that Jesus died for you, you trust Him alone to give you what He has promised.